SpaceX, the private space company founded by entrepreneur Elon Musk, made history in the world of privately-funded space travel with its Dragon and Crew Dragon spacecraft. In March 2019, SpaceX's Crew Dragon, the company's spacecraft designed to carry astronauts into space, completed its first test mission to the International Space Station (ISS). Prior to that, in 2012, the Dragon cargo spacecraft made history when it was the first private spacecraft to berth with the ISS. Since then, Dragon has continued carrying cargo to the ISS under commercial agreements with NASA. SpaceX successfully launched the Crew Dragon capsule to the ISS on March 2, 2019 from a two-stage Falcon 9 rocket. The spacecraft then docked with the ISS on March 3, and returned to Earth on March 8. The six-day flight was uncrewed but carried a sensor-laden dummy astronaut named Ripley. The dummy recorded a slew of information on what future live astronauts will experience while riding in the Crew Dragon capsule. The spacecraft also carried an adorable "zero-g indicator" — a plush toy version of Earth thrown in at the last minute. The toy floated around the cabin when the spacecraft experienced microgravity. SpaceX unveiled its design for the crewed spacecraft in 2014 to great fanfare. It's essentially a modified version of SpaceX's robotic Dragon spacecraft. Crew Dragon can carry up to seven astronauts, includes a life support system, an emergency-escape system, touch-screen displays, windows and other passenger-related equipment. Another design change is that Crew Dragon docks directly to the ISS while the Dragon freighter is grabbed by the orbiting lab's large robotic arm and brought into place. Celestial Buddies' Planetary Pal Earth plush toy floats in zero-g on board SpaceX's first Crew Dragon spacecraft. SpaceX founder Elon Musk has said he named the Dragon spacecraft after the song "Puff, the Magic Dragon," a 1960s tune from folk group Peter, Paul and Mary. Musk chose the name, he said, because critics considered his business plan impossible when he founded SpaceX. In fact, Musk and SpaceX kept Dragon's first 18 months of development secret as the company publicly developed its light Falcon 1 and heavy-lift Falcon 9 rockets. The news became public in March 2006 after SpaceX and several teammates submitted a proposal for NASA's Commercial Orbital Transportation Services (COTS) demonstration program. NASA accepted the SpaceX proposal in August 2006. SpaceX initially received a contract valued at up to $278 million; later, other milestones were added that boosted the total possible contract value to $396 million. SpaceX had proposed to fly the Dragon spacecraft on three Falcon 9 rocket flights — a design that was still under development. At the time, SpaceX planned to fly those flights in the 2008-09 timeframe, but the design, approval and milestone process took years longer than anticipated. Dragon passed a NASA critical design review in October 2007, marking a key milestone, as this is when the shape of the spacecraft was determined. The next month, SpaceX broke ground for a launch site at Cape Canaveral Air Force Station. A look inside the SpaceX Dragon capsule and its Falcon 9 rocket. As Dragon development moved forward, NASA offered more funding and in April 2008, the agency awarded SpaceX a launch services contract. Dubbed "indefinite delivery/indefinite quality," the pact allowed for NASA to order anywhere between $20,000 and $1 billion worth of launches from SpaceX through December 2012. Then came a large breakthrough. In December 2008, NASA selected SpaceX's Falcon 9 Dragon combination for cargo resupply to the ISS. The contract was for a minimum of $1.6 billion, with the option to extend services to up to $3.1 billion. Musk stated that it was a "tremendous responsibility" for SpaceX, given the upcoming retirement of NASA's space shuttle program. SpaceX placed communications hardware on the STS-129 shuttle flight in November 2009 to assist with their future flights to the station. The company launched their Falcon 9 rocket test flight in June 2010. This flight included a "qualification unit" of the Dragon spacecraft that was primarily supposed to transmit data during its ride into space. With the test unit successfully flown, SpaceX turned its attention to sending the real Dragon on Falcon 9. The first test of the actual Dragon spacecraft came on Dec. 8, 2010. The mission was a success and marked the first time a private unmanned space capsule was recovered safely back on Earth. With the world watching, SpaceX prepared to send the first cargo demonstration flight to the station in May 2012. An abort took place after a problem was detected in one of the engines, pushing the launch back a few days, but the spacecraft made it into orbit on May 22. Three days later, Dragon made its final approach to the ISS. The spacecraft experienced some problems with its laser distance-judging system when the laser got "distracted" and began bouncing signals off the wrong part of the station. SpaceX controllers then narrowed Dragon's view, and the approach proceeded. Dragon's first official supply run took place in October 2012. While the spacecraft made it into orbit safely, Falcon 9 experienced a problem with one of its rocket engines during flight. SpaceX adjusted the trajectory of the rocket to put Dragon on the right path. 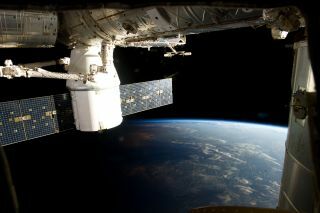 Dragon berthed with the station, and then splashed down successfully weeks later in the Pacific Ocean near California. The private Dragon capsule built by SpaceX is seen at the end of the International Space Station's robotic arm during its undocking on Oct. 28, 2012, in this camera view. The Dragon capsule made the first commercial cargo delivery to the space station for NASA. One Dragon spacecraft was lost en route to the ISS in 2015 when the Falcon 9 rocket carrying it failed, causing a catastrophic explosion. Space station flights were delayed by several months while SpaceX addressed the underlying problem. Cargo flights resumed in 2016; a Falcon 9 exploded on the launch pad later that year, once again pushing flights back until 2017. SpaceX was one of three companies that received commercial resupply contracts from NASA in January 2016. Between SpaceX, Sierra Nevada Corp. and Orbital ATK, the contracts are valued at up to $14 billion. (Who gets how much depends on the exact mix of spacecraft NASA requires for ISS objectives.) NASA also periodically awards more space station cargo missions as required, which is what happened with SpaceX in February 2016. One thing that sets Dragon spacecraft apart from other ISS spacecraft is the ability to survive re-entry with delicate cargo on board. NASA often uses Dragon spacecraft to send back life sciences experiments (such as experiments that collect samples of urine or blood from the astronauts aboard the ISS). The samples are refrigerated in the spacecraft and picked up quickly after splashdown. Dragon can also carry back living creatures, allowing for biological experiments on the ISS. Learn more about the Dragon and Crew Dragon designs on the SpaceX website. Follow the latest updates from NASA's Commercial Crew Program on their blog. Find out more about Boeing's crewed spacecraft, the CST-100 Starliner, on their website. This article was updated on March 14, 2019 by Space.com Reference Editor Kimberly Hickok.